Appaserver is a MySQL user interface. It uses Apache to couple MySQL to your browser. 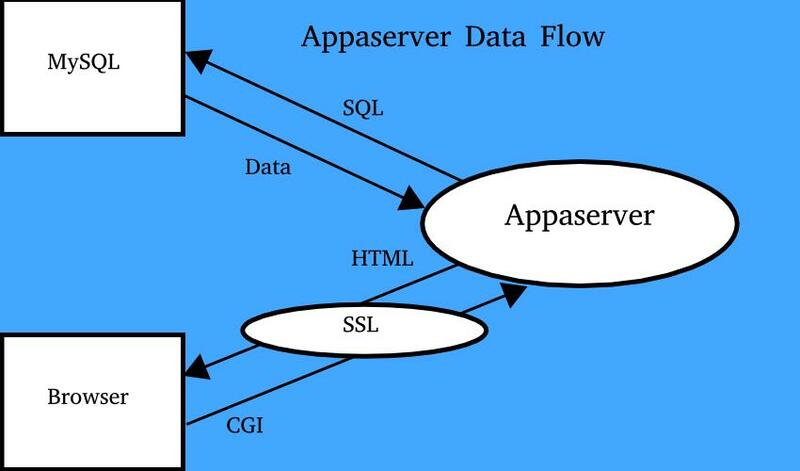 Refer to the Appaserver Data Flow diagram. The cycle begins by first choosing a table to insert into or lookup from. Appaserver generates and sends a select SQL statement to MySQL, requesting the column names of your table. MySQL returns data containing the table's column names and other metadata to Appaserver. Appaserver then generates HTML tags and sends them to your browser. The HTML tags will be blank widgets if you are inserting and query widgets if you are selecting. 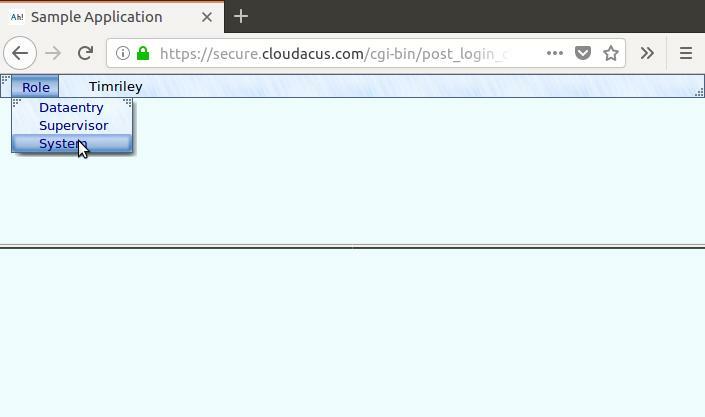 Your browser displays a dialog-box (form) that contains a Common Gateway Interface (CGI) "Submit" button. After you submit your form, the browser sends its contents to Appaserver. Appaserver generates and sends the next appropriate SQL statement to MySQL. The cycle then repeats. People may share names, but not within the same street address. Cities may share names, but not within the same state. A person may or may not reside in a city. People may change their names. Any misspelling must be able to be corrected. If a city is deleted, then people residing in that city must no longer reside in a city. 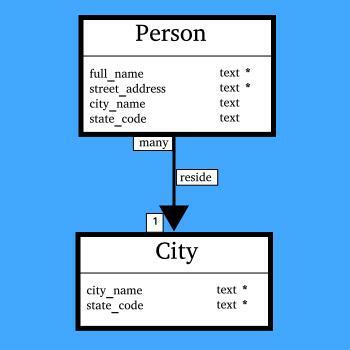 Figure 1: Database schema of many persons reside in one city. Appaserver stores tables in a table called "folder." (Unfortunately, "table" is a reserved word.) Likewise, Appaserver stores columns in a table called "attribute." (Unfortunately, "column" is a reserved word.) 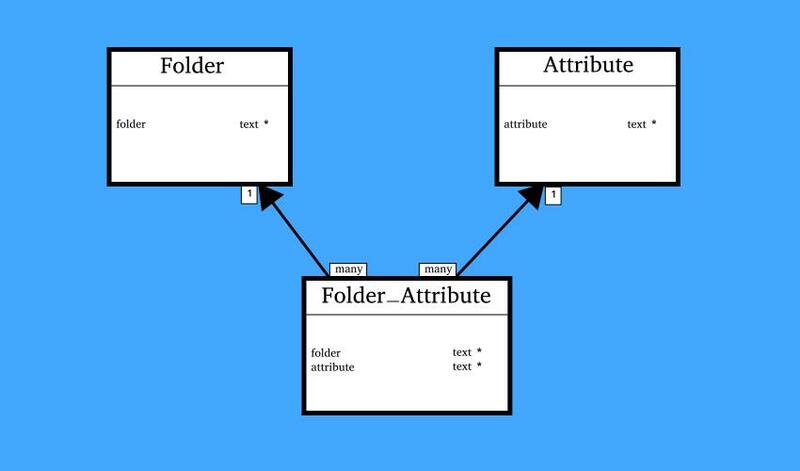 To show that an attribute helps describe a folder, insert a row into a folder called "folder_attribute." Figure 2 shows how to represent these properties in a database schema. Figure 2: Storing folder and attribute information. To create Appaserver applications, you first need Appaserver. Because Appaserver securely communicates with both Apache and MySQL, installation has multiple steps. The installation steps are available at github.com/timhriley/appaserver/blob/master/INSTALL. You will install a database called "template" from which all your applications are spawned. 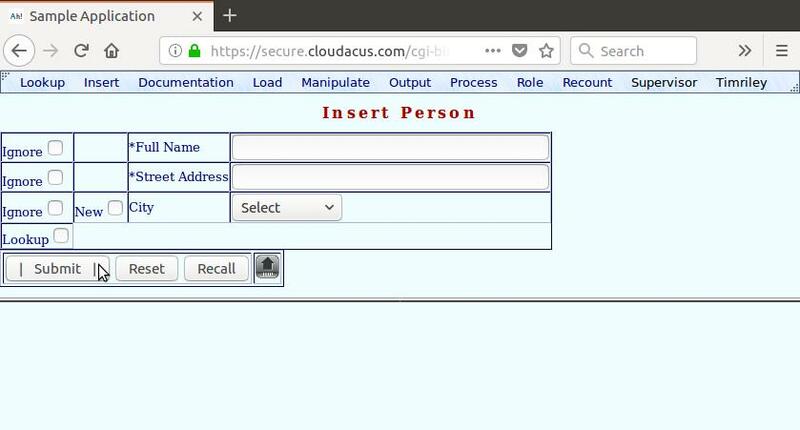 Alternatively, you can securely create an Appaserver application at cloudacus.com. After you create your first application from the template database, you are ready to build it. After you log in, you are presented with three preinstalled roles. See figure 3. Appaserver's security centers around roles. You grant permissions to roles, and you assign users to roles. The "System" role is used to build your database. Users interact with the database in all the other roles. The "Supervisor" role has permission to delete too much, like populated cities. Subordinate user roles may be created. The lowest subordinate role is "Public." The "Public" role has select permission only. It is used in publicly funded research applications. 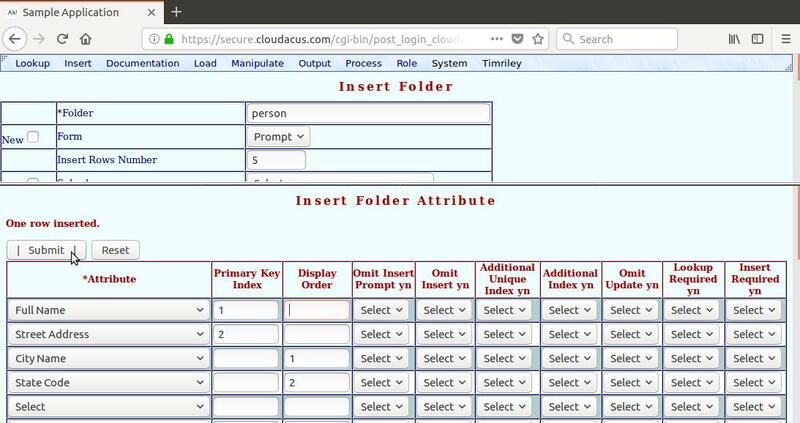 Cloudacus hosts a research application called "Benthic." 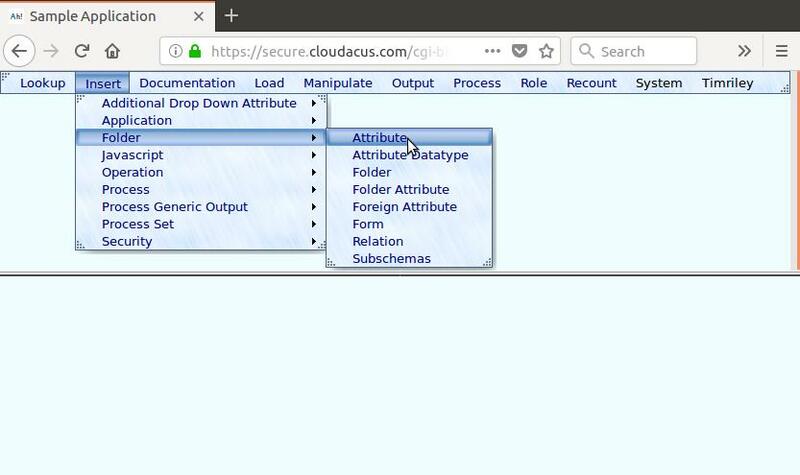 See cloudacus.com/benthic. "Public" also may be used in commercial applications to display inventories. The next lowest subordinate role is "Dataentry." We will give the "Dataentry" role insert permission but not update nor delete. If someone in the "Dataentry" role comes across a mistake, then a supervisor needs to be interrupted to make the fix. You may create many subordinate roles above these two. Figure 3: Choose System role. First insert the attributes into your database. The menu path is "Insert", "Folder", "Attribute." See figure 4. Figure 4: Insert attribute menu path. Because we are not concerned with features, press the "Ignore" checkbox next to every row except "attribute.attribute", "attribute.attribute_datatype", and "attribute.width." All of our new attributes are text datatypes; therefore, select "Text" to the right of "attribute.attribute_datatype." Notice the asterisk (*) to the left of "attribute.attribute." It is a primary key and, therefore, required. Whereas you may enter in one attribute at a time, by leaving the primary key blank, you can generate multiple data entry rows to efficiently insert multiple attributes. Figure 5: Insert attribute prompt. The result displays in the bottom frame. The resulting form's title is also "Insert Attribute." You are presented with blank widgets. Type in the four "person" attributes and the maximum widths. See figure 6. Figure 6: Insert attribute rows. After pressing the "Submit" button in the bottom frame, four "insert into attribute" SQL statements are generated and sent to MySQL. If you inadvertently enter in a duplicated "attribute.attribute", it will be rejected and MySQL's "duplicate" error message will be displayed. After you insert the attributes, then insert the folders. The menu path is "Insert", "Folder", "Folder." See figure 7. Figure 7: Insert folder menu path. The resulting form's title is "Insert Folder." When inserting folders, it is best to start with the "one" folders in the diagram and work inward towards the "many" folders. (Refer back to figure 1.) Therefore, we will first insert "city" and then "person." See figure 8. You are presented with blank widgets containing all the attributes of the "folder" folder. We are going to insert the "city" row into the "folder" folder. Since we are not concerned with features, just enter in the first three rows. The "folder.folder" is "city", "folder.form" is "Table", and "folder.insert_rows_number" is 5. Users may insert five cities at a time. The "Table" form affects the behavior when a user chooses the "Lookup", "City" menu path. Because the "City" table is going to have relatively few rows, Appaserver will display the entire table without a query form. When you are finished, press the "Folder Attribute" button. Figure 8: Insert city folder row. 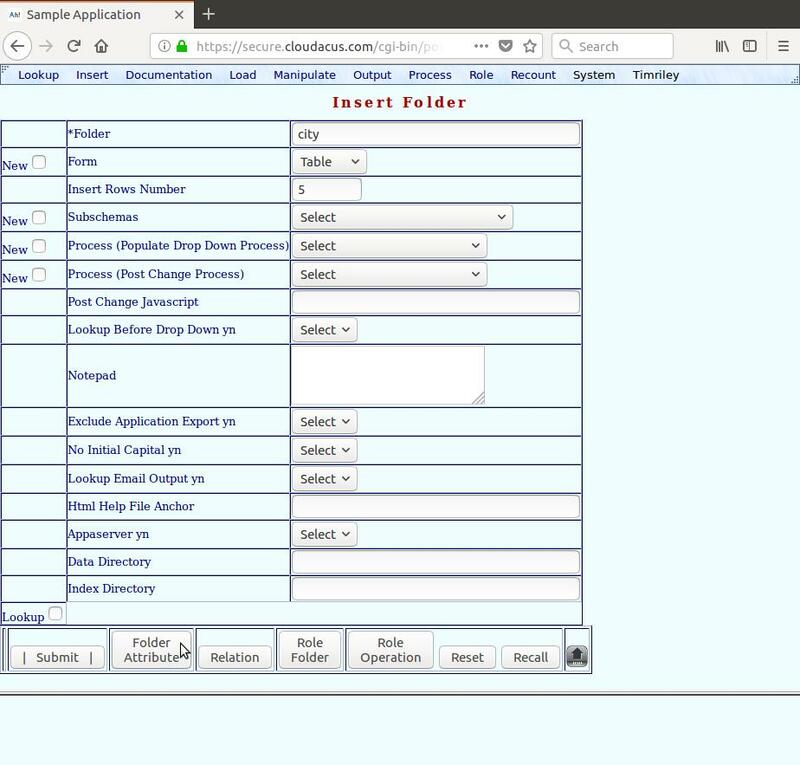 The resulting form's title is "Insert Folder Attribute." Assign the two attributes describing a city -- "city.city_name" and "city.state_code." Two cities may share the same name; however, they must be in separate states. Therefore, assign "city.city_name" as primary key index 1 and assign "city.state_code" as primary key index 2. See figure 9. Figure 9: Insert folder attribute for city. After pressing the "Submit" button, two "insert into folder_attribute" SQL statements are generated and sent to MySQL. This starts a series of data entry blocks. (Refer back to the row of buttons in figure 8.) The next block is to insert many-to-one relations. Press "Submit" without entering any. The next block is to insert role permissions for "city." 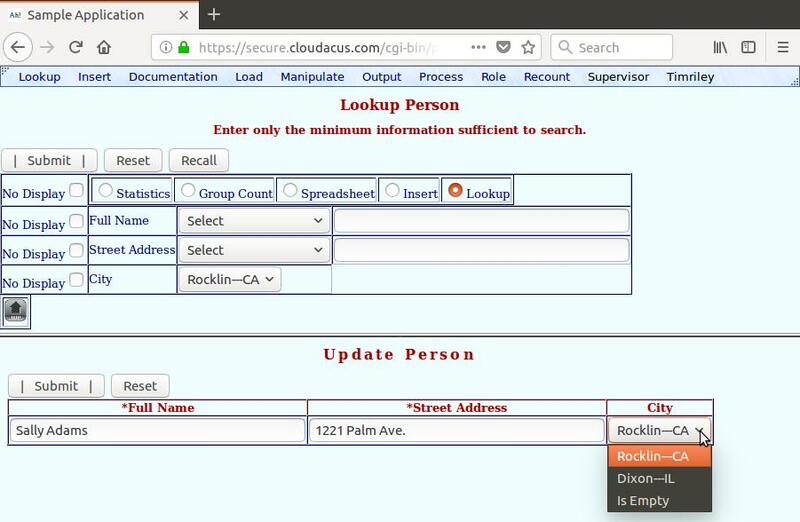 We will give the "Supervisor" role insert and update permissions. See figure 10. Figure 10: Insert role folder for city. After pressing the "Submit" button, two "insert into role_folder" SQL statements are generated and sent to MySQL. The next block is to assign Appaserver operations to roles. Appaserver operations are external programs that execute on a single row. One valuable operation is "Detail." 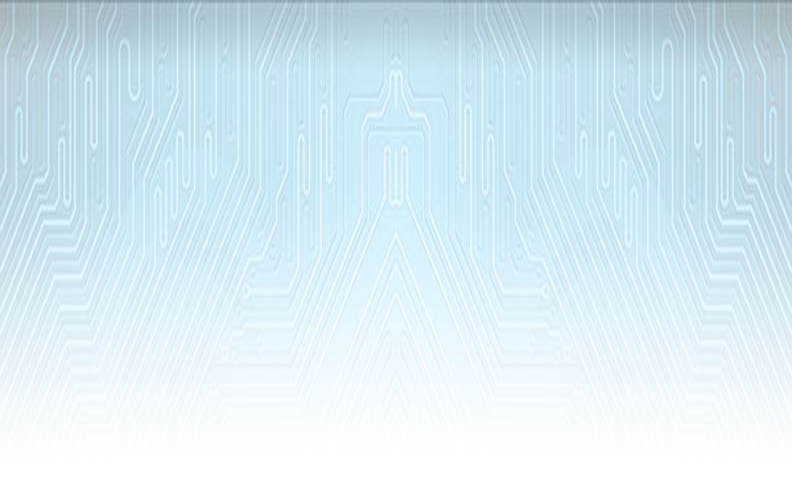 It allows you to drill-down on a row to display all of its many-to-one and one-to-many metadata. Then each metadata row has a "Detail" button, allowing you to traverse your entire database. The "Supervisor" role also needs to be able to "Delete" a city. See figure 11. Figure 11: Insert role operation for city. After pressing the "Submit" button, two "insert into role_operation" SQL statements are generated and sent to MySQL. This completes the series of data entry blocks. The resulting form's title is "Insert Complete." See figure 12. Enter in the first three rows -- "folder.folder" is "person", "folder.form" is "Prompt", and "folder.insert_rows_number" is 5. Users may insert five persons at a time. The "Prompt" form affects the behavior when a user chooses the "Lookup", "Person" menu path. Because the "person" table is going to have many rows, Appaserver will display a prompt form (query widgets) before the table form is displayed. Appaserver will generate a "where clause" before selecting from "person." Figure 12: Insert person folder row. The "Folder Attribute" button causes two activities to take place: 1) An "insert into folder" SQL statement is generated and sent to MySQL. 2) The "folder_attribute" table is displayed with blank widgets for data entry. (Refer back to figure 2.) The resulting form's title is "Insert Folder Attribute." Enter in the four attributes describing "person." Two persons may share the same name; however, they must not also share the same street address. Therefore, assign "person.full_name" as primary key index 1 and assign "person.street_address" as primary key index 2. Assign "person.city_name" as display order 1, and assign "person.state_code" as display order 2. See figure 13. Figure 13: Insert folder attribute for person. After pressing the "Submit" button, four "insert into folder_attribute" SQL statements are generated and sent to MySQL. This starts a series of data entry blocks. (Refer back to the row of buttons in figure 12.) The next block is to insert many-to-one relations. Set "Folder (Related Folder)" to "City", and set "Attribute (Related Attribute)" to "Null." See figure 14. Figure 14: Insert person/city relation. If the foreign key attributes differ from the primary key attributes by one attribute name, then set "Attribute (Related Attribute)" to the differing attribute name. The differing attribute name would have to map to the last primary attribute name. It is possible to model multiple differing attribute names; however, not here. Instead, you would insert all of the foreign attributes into the "foreign_attribute" folder. We set "Attribute (Related Attribute)" to the null string as a placeholder. "Attribute (Related Attribute)" maps to "relation.related_attribute" which is a primary key; therefore, it cannot be null. You can glean a detailed understanding of how relationships are modeled from appahost.com/appaserver_database_schema.pdf. Figure 15: Database schema of many persons reside in one city (redux). After pressing the "Submit" button, an "insert into relation" SQL statement is generated and sent to MySQL. The next block is to insert role permissions for "person." We will give the "Supervisor" role insert and update permissions. We will give the "Dataentry" role lookup and insert permissions. "Lookup" and "Insert" refer to the first two menu choices located at the top-left corner of the top frame. See figure 16. Figure 16: Insert role folder for person. After pressing the "Submit" button, four "insert into role_folder" SQL statements are generated and sent to MySQL. The next block is to assign Appaserver operations to roles. Assign the "Detail" operation to "Supervisor" and "Dataentry", and assign the "Delete" operation to "Supervisor." See figure 17. Figure 17: Insert role operation for person. After pressing the "Submit" button, three "insert into role_operation" SQL statements are generated and sent to MySQL. This completes the series of data entry blocks. The resulting form's title is "Insert Complete." 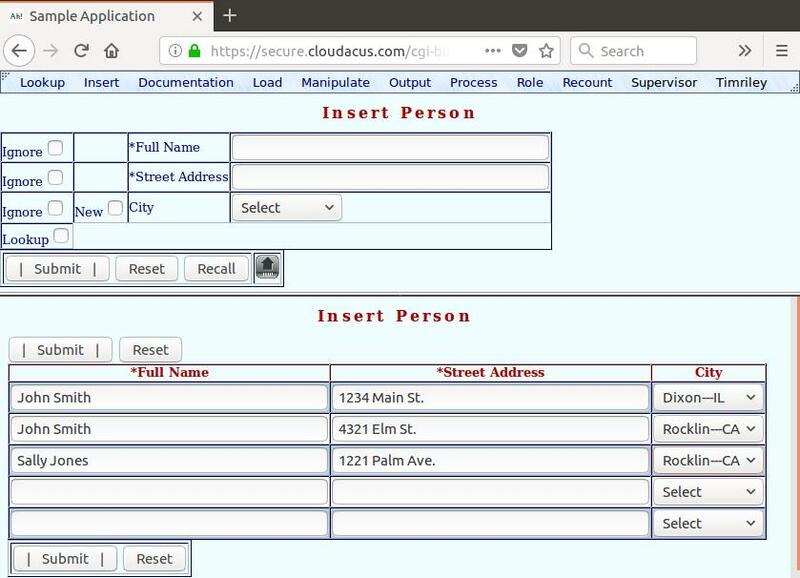 After you finish the series of data entry blocks, create the "person" and "city" tables. The menu path is "Process", "Create Table." See figures 18 and 19. Figure 18: Create table menu path. Figure 19: Create person table. Repeat the "Create Table" process for the "City" table. See figure 20. Switch to the "Supervisor" role. The menu path is "Role", "Supervisor." You may want to switch to the "Dataentry" role to test the restricted permissions. Figure 20: Choose role Supervisor. To insert new cities, the menu path is "Insert", "City." See figure 21. Figure 21: Insert city menu path. The resulting form's title is "Insert City." Earlier, we set "folder.form" to "Table" and "folder.insert_rows_number" to 5 where "folder.folder" is "city." (Refer back to figure 8.) You are, therefore, presented with five rows of blank widgets containing the two attributes of the "city" folder. Figure 22 shows these blank rows populated with two cities. Figure 22: Insert multiple cities form. To insert new persons, the menu path is "Insert", "Person." See figure 23. Figure 23: Insert person menu path. See figure 24. The resulting form's title is "Insert Person." Earlier, we set "folder.form" to "Prompt" where "folder.folder" is "person." (Refer back to figure 12.) You are, therefore, presented with a prompt form containing blank widgets representing the "person" folder. Notice the asterisks (*) to the left of "person.full_name" and "person.street_address." They are primary keys and, therefore, required. 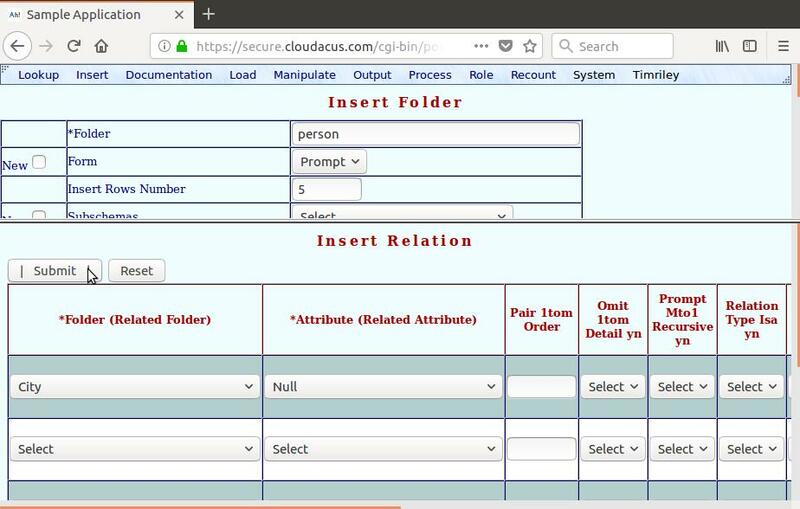 Whereas you may enter in one person at a time, by leaving a primary key blank, you can generate multiple data entry rows to efficiently insert multiple persons. Figure 24: Insert person prompt form. Earlier, we set "folder.insert_rows_number" to 5. (Refer back to figure 12.) 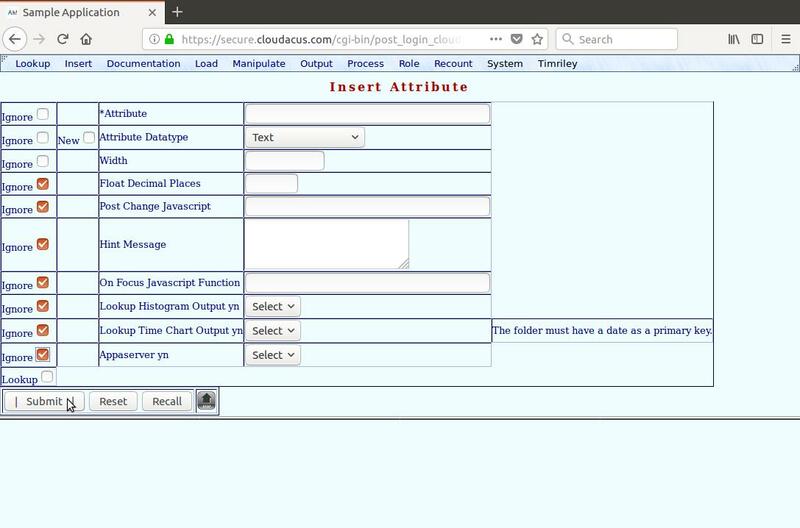 By pressing "Submit" without all the primary key attributes populated, Appaserver presented five blank rows in the bottom frame. Figure 25 shows these blank rows populated with 3 persons. Figure 25: Insert persons table form. Assume multiple persons have the same name. Also, assume a female is engaged and will likely change her name. Moreover, a person is looking to move. These three scenarios may cause a database developer consternation. However, the primary keys for the "person" folder are both "person.full_name" and "person.street_address." Therefore, "person.full_name" can be duplicated. Moreover, Appaserver propagates changes in a primary key across the foreign keys of related tables. Therefore, names can change and anyone can move. 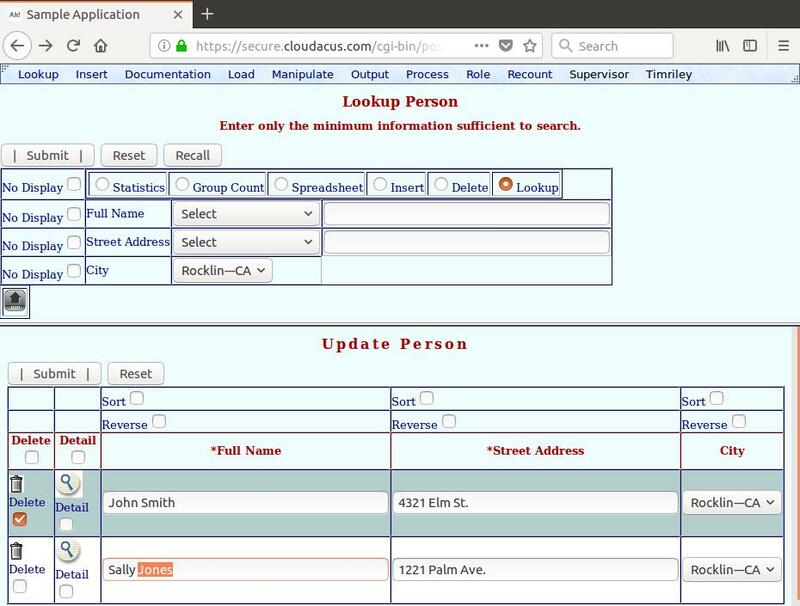 To lookup an existing person, the menu path is "Lookup", "Person." See figure 26. Figure 26: Lookup person menu path. See figure 27. The resulting form's title is "Lookup Person." Earlier, we set "folder.form" to "Prompt" where "folder.folder" is "person." (Refer back to figure 12.) You are, therefore, presented with a prompt form (query widgets) representing all the attributes of the "person" folder. You can select all or some persons, like those living in Rocklin. Figure 27: Lookup person prompt form. After pressing "Submit", Appaserver displays the selected rows in populated widgets. The "Dataentry" role will receive view-only widgets; the "Supervisor" role will receive changeable widgets. Assume you want to change a person's name and delete a person. See figure 28. Figure 28: Update and delete person. Figure 29 shows the finished result. Detailed documentation is available at appahost.com/appaserver, including appahost.com/appaserver_database_schema.pdf. 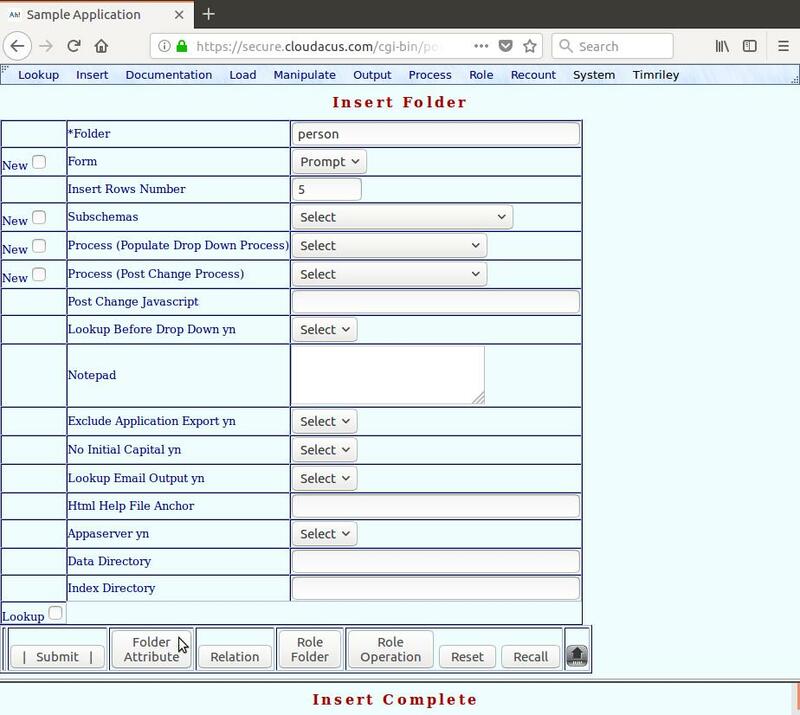 Your blank Appaserver application came with a process to import PredictiveBooks Home Edition -- an accounting application. Trace through it. Appaserver implements the relational model with a user interface. The user interface is consistent within your application -- both at the system level and the user level. Once you discover its look and feel, those skills will transfer to any other Appaserver application.